The Mythic Tarot uses Greek mythology to hold a mirror up to our lives. Hand-drawn in a storybook illustration style, the attention to detail is incredible. Every ringlet of hair and blade of grass can be seen. 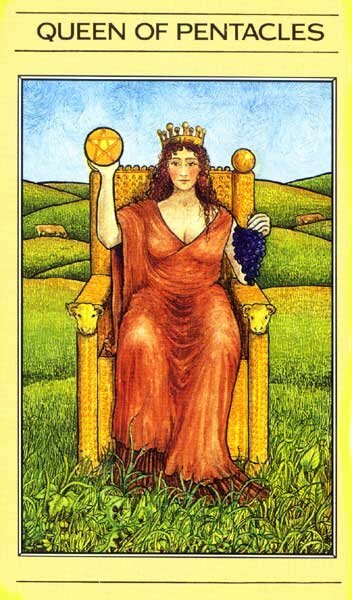 The major arcana consists of characters from legend like the Star (Pandora opening the Box) as well as the pantheon of Greek Gods and Goddesses: Demeter as Empress, Zeus as Emperor, Persephone as the High Priestess, Chiron as the Hierophant... etc. The minor arcana portray Greek Myths - one for each suit - as they progress. Wands portray the adventures of Jason and the Argonauts while on their quest to retrieve the golden fleece from the claws of a terrible dragon. The suit of cups tells the story of the relationship between the god Eros and mortal princess Psyche, from chance meeting and heartbreak to the happily-ever-after ending. Swords tell the tale of Orestes and the cursed house of Atreus, and it�s refreshing to find there is no holding back on the conflict, strife and suffering of this suit. The suit of Pentacles tells the story of Daedalus, the skilled Athenian craftsman who built the labyrinth for King Minos of Crete but who struggled with the challenges of both success and failure in his life and career.